**** updated **** 8:05pm Hammock. Rockstar and Bayleigh. Bay -…cocky and sickening and Angela looks dumb. Its literally I’ve been defending her since day 2. Whenever anyone says anything about her I am like no she’s good yada yada yada! But then you (Angela) throw me up the first chance you get. Its like okay!? And everyone else I have no problem with but I will say I feel bad for Kaycee and I am sorry that I made her cry but that’s something I can’t really control either. And everyone else, it is what it is. 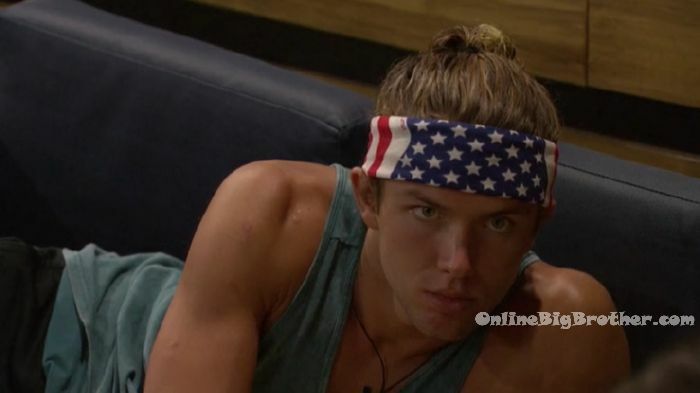 Haleigh – its going to be a long week. Bay – not really its almost already Tuesday. 2:03pm – 2:23pm HOH room. Angela, Kaycee and JC. JC – how are you doing little girl? You did an amazing job. So update.. Rockstars game is so f**king weak. She said I really don’t think Bayleigh is the hacker. Like you’re on the block? If it was me I would be like she’s the F**KING HACKER!! Kaycee – she is defending her? JC – I can’t even deal with her right now. It does make sense that she would be the hacker. That or Scottie. Angela – if he was the hacker, he wouldn’t be f**king with me. If Bay really wasn’t the hacker her and Fes would be running around trying to figure out who is the hacker but they’re not they’re just sitting around. JC – today is going to be intense. Right now she is just thinking about what she is going to do. 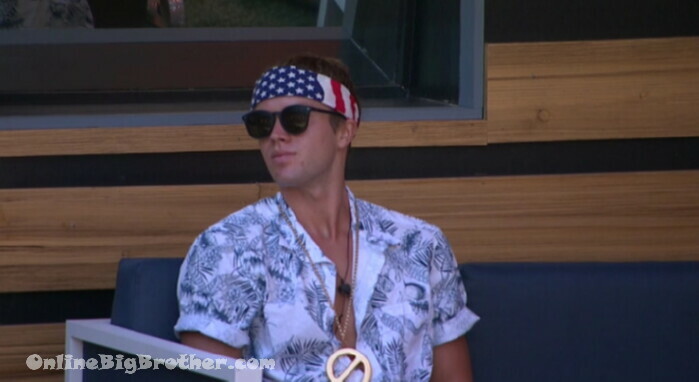 ** Updated ** Big Brother Spoilers Angela used the power of Veto on Tyler. Angela nominated Bayleigh in his place. Bayleigh says Tyler went off on her and made it look like she’s the hacker this whole time..
Bay – I’m just confused..
Angela – I trust Bayleigh I don’t think she’s the hacker..
10:56pm HOH room. JC, Kaycee and Angela. JC – their kissing a$$ is so strong. Angela – its so strong. She’s brought me three meals up here today. Haleigh brought me one, Rockstar brought me carrot cake last night and pancakes this morning. Kaycee – its so f**king obvious. Angela – Haleigh came and feed me salad. Haleigh came and kissed me goodnight. Until they felt like their backs were against the wall, no one talked to me. They ignored me and now that they don’t feel safe they have been so nice to me. Promising me deals, trying to make alliances with me. JC – to be honest I feel bad for Fes. He keeps going with the girls and then the girls literally don’t give a f**k about him.